It should be a place of retreat after a long day's work or an exhausting day with the kids. It's nice to have a romantic, serene place to end the day. Warm tones help to set that mood; they are more relaxing than bright colors. However, the color is not necessarily as important as the hue of the color. For instance, if yellow is your choice of color, use a muted yellow instead of a bright yellow. Lighting plays an important role in the peacefullness and ambiance as well. Add an elegant chandelier and install a dimmer switch to control the lighting. You can read about the importance of lighting in my previous post. Get rid of the clutter! It's proven that being in a cluttered room adds to anxiety and can affect your sleep. A clean, organized room is tranquil and calming. It's hard to fall asleep when you're staring at a pile of laundry or books and papers on the nightstand that need attending to. 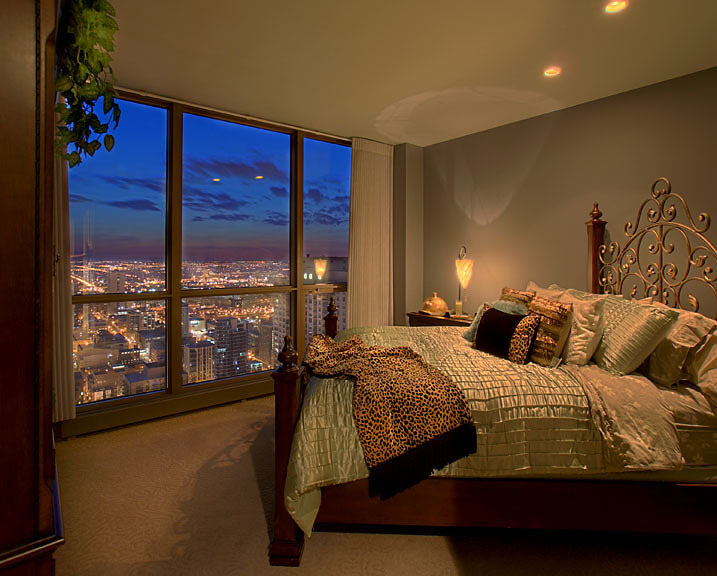 If you have a beautiful view like this room, angle the bed towards the window. There's nothing more beautiful and tranquil than going to sleep and waking up to a breathtaking view. If you have the space, designate a corner of the room to watch TV separate from your bed. Treat yourself to a nice comfortable chair and ottoman to kick back and watch your favorite show. Having a separate seating area keeps your bed cool and crisp to slip into, for a good night's sleep. 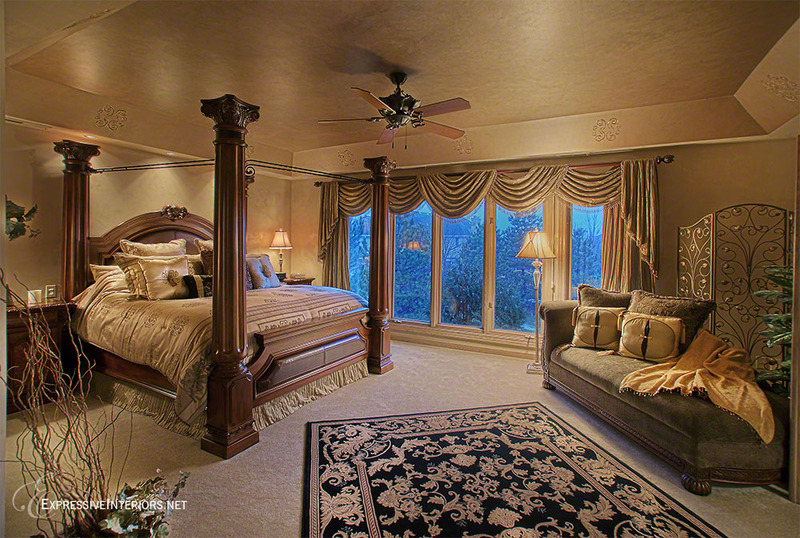 Here are a few bedroom retreats that are fit for a king or queen. Whether you prefer contemporary, traditional or transitional design, your bedroom should reflect your personality. Work hard, play hard and end the day in your own beautiful serene sanctuary. Creating interiors that reflect your personality and lifestyle. Follow Expressive Interiors on Houzz! 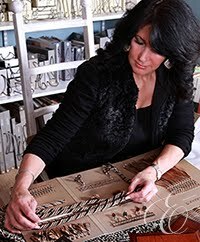 © 2012 Expressive Interiors, Inc. Powered by Blogger.